My last Azerbaijan Adventures post marked our return to civilization via some of the most obscure roads in the Caucasus. There are, however, many more exciting destinations in Azerbaijan, and today I’ll mention some of the interesting spots I visited during a previous trip. Sticking to the mountain theme, if you’re not prepared for a long journey in the northeast region, you can try Lahic. Lahic (pronounced Lahij) is only a dozen miles from the Shamakhi-Shaki road, which makes it a lot less isolated than remote Xinaliq. I even hear that the dirt road which constitutes the only access to the village will be asphalted soon, if it’s not already done (this is according to Mark Elliott’s invaluable Azerbaijan guide, as usual). In the meantime, it still takes almost an hour to cover that small distance. Despite its proximity to the main road and the influx of visitors from the capital on weekends, it remains a sleepy picturesque highland village. Like in Xinaliq, the locals speak their own dialect, this one Persian-based. Here’s the grocery store on the main street. As per usual in Azerbaijan, you’ll find melons, watermelons, cucumbers, potatoes, eggplants, peppers, tomatoes, and a few other things. In fact, I’d say the variety is rather unexpected for a mountain village (elevation 4,500 ft)! Below, the only car we saw. Not really adapted to the local tracks. The main attractions in town are the workshops and craft shops. The population’s trademark copper craft dates from the period when copper mines were active in the area. Although the ore has been depleted, the tradition remains. There are some interesting castles and mosques, too, but I’ll let you read about them in travel guides. On a typical tourist’s journey, old stones are legion. Fields of archaic derricks rotting in the middle of vast pools of oil? Not so much. Our tour of Azerbaijan is coming to an end, and with it the whole of my Caucasian adventures to date. So here’s my some advice for the intrepid traveler. It’s easy to rent an SUV in Baku, and you can even haggle for discounts at the rental agencies — something you may not have thought. The method isn’t all different from negotiating the purchase of a carpet: “the tires need to be changed”, “the other agency rents the same car cheaper”… Just keep in mind that Azerbaijan roads aren’t the lawless tracks they used to be. Although I once witnessed a Dagestani acquaintance drive to the airport at 100 mph without stopping at a single red light, I’ve been told red lights in Baku now have speed cameras. The good news is that cops didn’t seem corrupt (see: our friendly encounter in Quba), and we crossed the whole country without forking over a single bribe. One policeman even let us go with a warning after legitimately pulling us over for speeding — it’s not always the big bad Soviet cop vs the innocent tourists. Just hurry up, times are changing! Ilham Aliyev is turning the capital into a new Dubai, old dirt tracks are being replaced with tarred roads, and even the most remote villages sprout ugly cell phone towers at their centers. You (almost) can’t buy moonshine anymore, and before you know it, you won’t be allowed to butcher your lamb on the roadside! To conclude, I’ve thought of an original recipe contest: make an Azerbaijani dish with all the ingredients in the picture below (your choice of lamb cut, watermelon, melon, cucumber, tomato, onion, pepper, potato)! If it helps to inspire you, the photo was taken in Shamakhi. We last left off our Azerbaijan adventures with our arrival in the remote village of Xinaliq. Between the travel guides that present it as the Shangri-La of isolated picturesque mountain villages, and a new paved road that makes it accessible to any second-hand-Lada driver, there is enough interest in Xinaliq for the locals to have a modicum of organized tourist accommodation. You’re still unlikely to bump elbows with many foreigners (we didn’t see any others when we were there), but there’s a 3-room guest house with a bathroom and hot water (a rarity), and even a cell phone antenna in the middle of the village! Although we were told that there are some local culinary specialties known to the elders, we were treated to much less original fare: dolma, boiled potatoes, and kebabs cut from a rather lean lamb. All too soon, we realized that following any track wasn’t so easy. There were obviously no direction signs, and tracks regularly forked without guarantee they would merge somewhere further on. Our little map was of little help, and Traiblazer’s descriptions only take you so far (cross a “high, flower-filled plateau”, go down “a deep, muddy ford”, drive “past a lonely farmstead”). All this to say: we got completely lost. Unlike Georgia, where you can sometimes drive for hours without seeing a soul, there are still lots of people living in the mountains of Azerbaijan — or rather, many tiny villages and other small settlements. On one hand, it’s reassuring to know you’re not totally alone, but on the other, it’s not all that helpful when the locals speak only Azerbaijani, or worse, some dialect specific to their village. Here, there be no cell towers, no hot showers, no guest houses… Speaking of, as lunch time approached, we remembered that we hadn’t packed anything to eat. Luckily, one of the locals had been talking to us when we arrived (I take it they don’t see foreigners, or even out-of-towners, every day), invited us for lunch after we asked him with semi-feigned ingenuousness if he knew a place where we could eat. While we enjoyed a meal of watermelon, bread, cheese, and tea, our host told us how once upon a time he used to live in Moscow and get drunk. Now he lives in Zeyid, has quit drinking, and makes his own cheese in sheep skin. Back on the road… sort of. On a couple occasions, we found ourselves facing mostly-dry-but-quite-large river beds that forced us to turn around and look for another way. If I’m correct, the tiny village below should be Rük. I hear they even have a shop — convenient when the nearest town is about 3 hours away. A cemetery overhanging the valley. The village at the bottom might be Söhüb. Finally, after hours of dry landscape, the scenery finally became greener as we got closer to civilization. I remember spending a good five minutes with an old lady in a village nearby who didn’t speak a word of any language I knew, trying to get her to tell us where we were — I never did find out, so we just kept going straight. Mark Elliott, if you ever read this post, I’d love to hear from you to confirm it! Our stopover gets slightly extended, however, as I have the bright idea of losing my wallet. After spending a couple of hours looking for it and the evening mourning for it with a bottle of tutovka, I decide to stop at the police station on the way out of town the next morning. What follows is a quite unique succession of unlucky events. It turns out he’s not the local mafia boss, despite deceptive appearances, but the Chief of Police. He quickly places a call to a local garage, and gets the café next door to bring some tea and chairs for everyone. Trying to imagine a similar situation in Russia, I count how many bribes the Russian cops would have wanted to extort from us: one for blocking the street, one for calling a garage, one for having lost my green card, one for planning to drive without a licence, another one for not having a wallet… And don’t even think about getting tea and chairs! And there’s pakhlava next door, available in both the Quba (left) and Baku (right) variations. Pakhlava, however, isn’t the only sweet you find in Azerbaijan, even if it is the most famous. Here we’ve got some Turkish delight and fruit jellies as well. From here on, there are still many inter-village tracks that have never seen asphalt (and probably won’t in the foreseeable future). This is where we’ll head next time. It’s been almost 3 months since I last wrote about my adventures in the Caucasus. All this time, I’ve been planning to talk about the various kinds of baklava in Azerbaijan (locally known as pakhlava), but the task turned out to be harder than I anticipated. There are almost as many kinds of pakhlava as there are regions in Azerbaijan. You’ll find different variations in Baku, Ganja, Qabala, Nakhchivan, Shaki, and finally, Quba. The bad news is that the distinctions between them seem to be poorly documented. My cookbooks gave me a handful of recipes for the Baku, Ganja, and Shaki varieties, but the others remain a mystery, even in the days of the Internet. Today, I’m only documenting my encounter with Quban pakhlava. The Quba region is located in the northeast of the country, and its eponymous capital (population: 40,000) is the gateway to some of the most picturesque mountain villages of the country. Throughout the area, the roadsides are strewn with produce vendors as seen in Part 6, and also, in small villages, with pakhlava shops. We stopped at one of these just in time to watch the cook prepare a new batch of the sweet pastry. 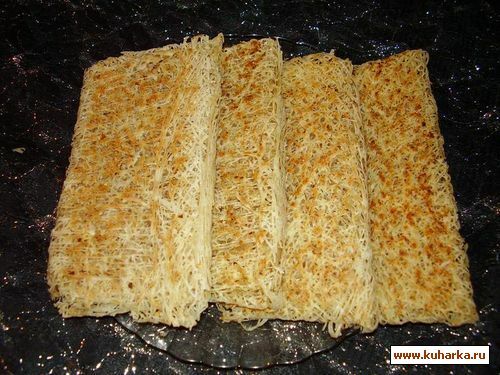 One of the characteristics of the pakhlava in Quba is the use of very thin latticed layers, prepared in a similar fashion as pancakes, instead of phyllo dough. These same layers are also used to prepare another specialty called bukma. The pictures below explain how they’re made. Step 1: Take a giant pan (at least 3 ft diameter) and heat it over a wood or coal fire. Rub the surface with a greased towel. Step 2: Place the dough in your special Quba-pakhlava dough pourer, and create a paper-thin latticed “pancake” by pouring the dough in a spiral motion first, then in criss-crossing lines. Step 3: The layer is so thin that it cooks almost instantly. When it starts to harden, fold in four (or any number that makes it easier to handle). Step 4: Transfer to a cooling tray and repeat a good 50-100 times. Try to ignore that you’re standing by a hot oven and, if it’s summer, that the temperature outside is around 100F. Once you have all your layers, you basically take half of them, cover them with syrup, spread a ground walnut mixture on top, add the rest of the layers with more syrup, and finally decorate the top with walnuts and a colored syrup that may or may not contain saffron. And this is about all I know… So I’d like to reach out to the handful of people who 1) are from Azerbaijan, 2) read my blog, and 3) know something, or know someone who knows something about pakhlava. Do you have a recipe for gubinskaya pakhlava, or any of the other lesser-documented kinds? Do you know the difference between a pakhlava from Sheki and a pakhlava from Quba? Do you really use saffron to color the top layer? If you live in the U.S.A., what kind and brand of flour do you use? Now that most if not all factories have closed, there remains a photogenic dilapidated mess of funky buildings and equipment. I’m no specialist of factory design, but where else do you see such massive group installations like this one, outside of the post-Soviet space? And what’s the story of this funny building? Why are there windows only on the top floors, and a gap in the middle? Is it supposed to look like it’s collapsing by design? Someone must have noticed that those vertical white lines weren’t all that vertical when they were making them, no? A little bit further on the road, we hit a small derrick field. The old oil derrick is such a fixture in Azerbaijan’s landscape that it deserves a separate post (coming soon). There are many other abandoned factories in the country, especially in the South and the central region, but they’re further away from the touristy track — insofar as you can talk of tourism when the only other foreigners I’ve seen were there on business trips. Others watch their flocks or harvest their fields. Makes it seem a bit like Azeris are hard-working, while Georgians just like to feast and party! Of course, the “new” regime, led first by the same former communist boss who used to be the head of the KGB and the country, and then by his son, added its own marks to the landscape, in the form of various billboards in every town and on every road. One classic version represents the patriarch Heydar Aliyev alone (see my Azerbaijan Adventures, Part 2 for a short bio), and the other shows father and son Ilham in deep discussion, the son absorbing the lessons of a man who ruled Azerbaijan in various functions over 30 years. Note to sonny: when daddy’s billboards start fading, they should be refreshed to keep inspiring respect in the populace. Finally, we’re now entering the region of Quba, whose singular location between the mountains and the sea is, as we’ll see next time, well-suited for growing produce. After exploring Baku’s restaurants, now we’re heading to the city’s main market, Taza Bazaar, one of the oldest in the city. Much larger than the central markets of Yerevan and Tbilisi, Taza Bazaar is probably the largest of its kind in the Caucasus. Not only will you find a variety of foods, with a strong emphasis on vegetables (in summer, at least! ), but a whole section is dedicated to various hardware, and, more opportunely, kitchen utensils. This is a great place to buy a samovar or a special cast-iron pan for your Chicken Tabaka. The wide variety of climates throughout Azerbaijan allows for a phenomenal variety of fruits. Pineapples and bananas, apples and pears, stone fruits, citrus fruits, berries — this country has it all. Not to forget the ubiquitous watermelon. FYI, if a vendor tries to convince you that it costs $40 a piece, even if he seems to be doing very complicated operations on his scale, he’s lying. Vegetables and herbs are about as diverse. Some of the displays pack all the classic vegetables of a typical Caucasian meal neatly stacked side by side: cucumbers, tomatoes, peppers, and eggplants (plus some corn and potatoes for good measure). You’ll also see enough vine leaves to make lots and lots of dolmas. For the winter months, you can find nearly the same selection in jars. Every produce under the sun — mushrooms, garlic bulbs, tomatoes, gherkins, olives, cherries, plums, apricots, pineapple, kiwi, walnuts, just to name a few — is neatly lined up in a colorful display. In the dairy department, this booth gets the gold medal for the largest piling of curious junk. I counted no fewer than 6 vintage refrigerators, despite the fact that most of the merchandise is left outside. And what’s up with all the plastic pails? The large sacks on the counter contain cheese, I know that much. Given the size of the space, the variety of dairy products isn’t actually all that impressive: from what I could tell, we’re talking about cream, butter, milk, yogurt, and maybe half a dozen cheeses. Although you may not see it on display because of the heat (over 100 F that day), there are also several vendors selling smoked fish. Just look for the antiquated freezers next to the stands that seem empty. I don’t remember exactly if the selection was limited to sturgeon, but we ended up tasting only that. Again, because of the heat, and despite the advent of refrigeration, expect it to be tasty but very salty. Luckily, the saltiness can be somewhat tempered by serving the fish with heavy cream and pancakes or potatoes. Caviar follows a similar pattern. You probably won’t see it on display, as it is kept in refrigerators somewhere else. Ask around, and someone will take you to a small structure away from prying eyes, where the Great Game of Caviar Bargaining can begin. I should dedicate a separate post to the subject (The Art! ), so for now I’ll just focus on my Baku experience. The only thing that takes more time than buying caviar is buying a carpet. Incidentally, depending on their respective amount and size, they can cost about the same. First, we tasted a few “different” kinds. I say different between quotation marks because when the vendor has a tool to open and reseal caviar jars, and tends to carelessly stack lids of various colors on the table, there’s no way to know what’s what. The guy could get hold of a stock of beluga lids and run a pretty lucrative scam — he wouldn’t be B.S.ing his customers more than he already is. And speaking of B.S., the small jars in the picture used to be a standard 4 oz. Now the glass at the bottom is thicker, and the weight of the contents is down to 3.5 oz… except in every other jar, the thickness of that bottom is different! So basically, don’t listen much to the sellers. Just pick what you like best. From the almost-black color of the eggs, you can tell all the jars in the picture are very salty (the heat, remember?). It’s not bad, but it’s not the best kind either, and it’s not particularly cheap. And believe me, I tried. I haggled, and haggled, and haggled, until my friends got nervous we were going to end up in a fight. My recommendation (as of the summer of 2011, at least) would be to skip the caviar in Baku and pay a visit to the central market in Kiev instead (Kiev happens to be a very convenient stopover if, like me, you have to travel half the globe to get to Azerbaijan): the prices are lower and the quality higher. Off to the meat department. Lamb is king, of course. If, like Stalik Khankishiev, you believe it should never be refrigerated, you buy from the booth out front (did I say the temperature was over 100 F?). If, on the other hand, you agree that food safety is not a myth, the word bacteria rings a bell, and maybe you’ve even heard of the “danger zone” between 40 F and 140 F, the butchers in the back will help you. Here are two interesting cuts! 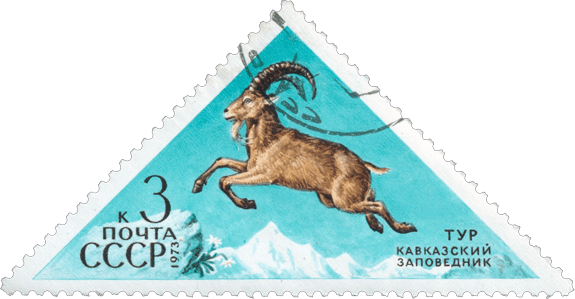 The cut on the left probably looks unfamiliar: it’s the tail of a fat-tailed sheep (kurdyuk in Russian), the preferred fat for any good kebabs east of Chechnya. On the right, the offals, all in one piece, for the proponents of nose-to-tail eating. The selection goes beyond lamb, though, as Azerbaijan is one of the rare Muslim countries where you can buy pork at the market! It’s also one of the few Muslim countries where you can drink as much as you want as long as you’re sober when you go to the mosque. The latter is even truer of Abkazia, but 1.) it’s not really a country, and 2.) they solved the dilemma by not building mosques. Next time, we’ll be hitting the road again to travel north to the mountain village of Quba! Adventure is a big word for today’s post. Sure, it mostly takes place in caravanserais and some of the meals were of epic proportions, but I’m still just talking about restaurants and food. After our short trip to Nakhchivan, nest of spies, we’re back in Baku, ready to enjoy the opportunity to eat something other than lamb kebabs and tomatoes. Baku offers a wide selection of international cuisines, with an emphasis on Turkish, Georgian, and Russian. Save for the Georgian restaurants which you may not be able to find back home, it’s wisest to focus on the Azeri cuisine. And while simple local places and out-of-the-way outdoor restaurants abound and usually serve good food, in the old city you also have the rather unique option to eat in converted cavaranserais. Mugam Club is my favorite such caravanserai restaurant. The fact that it’s a fairly expensive (by Azerbaijan’s standards) and touristy (by Azerbaijan’s standards) place with occasional mugam performances, folk dances, and even belly dancers shouldn’t dissuade even the most cynical among you from enjoying the atmosphere of the remarkable 16th century premises for the time of a meal. More pictures of the courtyard here. Without exploring the more obscure corners of Azeri cuisine, the menu covers the classics, often in many versions. The dolma, vegetables stuffed with rice and meat and served with yogurt, can be had in grape leaves, tomatoes, eggplants, or — of course — peppers. The kutab, a stuffed flatbread sprinkled with sumac, comes with four possible fillings: greens, pumpkin, meat, or cheese. In the vegetable appetizers, you’ll find various combinations of the ubiquitous peppers, eggplants, tomatoes, and onions. There’s the eggplant caviar. And the eggplant chikhirtma, which consists of onion, eggplant, and egg fried in oil. Finally, the similarly prepared vegetable ragu (no Azeri name) combines eggplant, pepper, potato, tomato, onion, and greens. Of course even in Baku, it’s hard to escape the kebabs. Here is a serious platter of lavash-wrapped lyulya-kebabs with grilled vegetables. These were among the best kebabs I’ve ever eaten. There are lamb chops and lamb kebabs, chicken kebabs, and “special” beef kebabs, but also skewers of sturgeon chunks and sturgeon lyulya-kebabs. Seasoned with spices and properly grilled, sturgeon can be soft and delicious. The next most popular caravanserai restaurant in the city is named Karavansara. There used to be this large sign above the building that you couldn’t miss when you entered the Old City, but I don’t remember seeing it last time I was in Baku so it may have been taken down. I didn’t document our meals there as thoroughly (it’s harder work than it looks), but here are a few appetizers. You’ll notice that the eggplant caviar, though containing a similar mix of eggplants, peppers, and tomatoes, looks completely different from the one at Mugam Club. The plate of smoked fish consists of sturgeon, salmon, and potatoes. Because the climate is so hot, smoked fish in Azerbaijan (as well as caviar) has traditionally been very salty, and the availability of refrigeration hasn’t really changed that yet. The choice of kebabs is more or less the same as at Mugam Club. I seem to remember that you can order the complete assortment on a dramatic presentation tray with coals in the middle (like this one). Finally, if you have the appetite, time, and money, spend another couple hours drinking tea with an assortment of sweets — Azeri baklava, candied fruits, and walnuts in honey. Enjoying a local “cognac” isn’t a bad idea either, and Tovuz is the most famous brand. You can even finish your evening with a hookah. Speaking of hookahs, Azerbaijan makes the best ones I’ve had so far, although I can’t really pinpoint what makes the difference. The bowl where the tobacco goes is often replaced with a carved out half-apple, and it’s not rare to be offered a variety of options to fill the base with — water, milk, wine, or cognac! However, keep in mind that weirder isn’t necessarily tastier. Below is the craziest configuration I encountered. On the final night of our last time in Baku, we wanted to have one last hookah while enjoying views of the old city from one of the rooftop cafes (I know, I know, I’m such a tourist :)). We placed our order with the waiter without even suspecting what was coming. Tobacco flavor? Mix of watermelon and mint. Liquid for the base? Milk, please. Regular bowl, apple bowl, or watermelon? (At this point I’m mentally trying to picture what the hell an actual watermelon has to do with a hookah pipe.) Hmmm, let’s try the watermelon thing, whatever that means. Next thing we knew (OK, not exactly next — it took about half an hour for them to prepare the beast), the waiter came back with a whole watermelon transformed into a hookah base. Now, is a watermelon hookah really better than a well-prepared one, with the apple bowl and milk? No. Nakhchivan, nest of spies? Read on to find out! Getting there is not all that easy. A landlocked exclave, Nakhchivan can only be reached from the rest of Azerbaijan by air. Azal, the Azerbaijan airline, lets you book your flight online for any destination — except Nakhchivan. The tickets only go on sale approximately 15 days in advance, and you have to buy them at an Azal office in person, or through a travel agency with a commission. Things started getting interesting when we landed at the airport, which sees only a handful of flights per day. As passengers entered the terminal, a police officer checked their passports, letting the Azerbaijan citizens through and putting aside the foreign passports. As one could expect, we were the only foreigners. After some vague attempts at interrogating us (he spoke only Azeri), he finally took us straight to a taxi and told the driver to bring us to our hotel, leaving us wondering if we got a local kind of VIP treatment or our first taste of Nakhchivani suspicion. Tabriz Hotel. Don’t bother making a reservation. As far as I can tell, the staff counts only one English speaker and one Russian speaker, and the chances that either of them happens to be near the reception desk when you make your call are pretty slim. Anyway, if you do get lucky, they’ll just tell you to call back a couple days in advance of your arrival. And indeed there’s no shortage of rooms. The building is 13 stories tall, but if it hadn’t been for a group attending a conference we would have been the only guests. The restaurant on the top floor is more memorable for its panoramic view of the city than for its food. At this point you may ask yourself what there is to see in Nakhchivan. The Mausoleum of Momine Khatun is nice enough, but it certainly doesn’t justify all this trouble. And the Blue Mosque is unlikely to remind you of Istanbul. Then of course, Nakhchivan is the birth place of Heydar Aliyev, and the museum dedicated to him reaches Vladimir-Illich-like proportions. But it’s really the semi-desert and mountainous landscapes that make the region so impressive. The Zangezur Mountains follow the entire northern border with Armenia. The road from Nakhchivan City to Ordubad is particularly spectacular, and it passes right next to the Iranian border, which can be crossed at Julfa. While you contemplate the pictures, let me tell you a little bit more about the exciting life of Heydar Aliyev, a man who dominated the political life of Azerbaijan with an iron hand for over 30 years. Two-time Hero of Socialist Labor, four-time holder of the Order of Lenin, he “started” his career as Deputy Chairman of the Azerbaijani KGB in 1964, and became Chairman in 1967. He was then appointed First Secretary of the Central Committee of Azerbaijan Communist Party by Brezhnev in 1969, fighting against corruption (i.e., purging his opponents) and increasing economic growth (particularly his own, with the mafia’s help). His ascension continued with the post of Candidate member of the Politburo in 1976, and full member in 1982. Gorbachev and his perestroika caused an abrupt turn of fate. Aliyev was forced to resign from the Politburo in 1987 because of his alleged corruption and ties with the mafia. He returned to his native Nakhchivan in 1990, and took the reins of the autonomous republic without any subordination to the official government in Baku. He returned to the capital in the middle of the political turmoil of 1993 and was elected President of Azerbaijan shortly after. Not only did he keep this post until his death in 2003, he also secured his son’s succession. Ilham Aliyev still holds the presidency to this day. Back to Ordubad. I already mentioned it in a previous post, when I wrote about the typical Azerbaijan outdoors restaurant experience. The town, an hour and a half away from Nakhchivan City, is worth visiting for its charming sleepy atmosphere. … And its abandoned Soviet factory, located right in the center. You can roam freely in the office buildings and the production plant, although as usual, nearly everything’s been looted. Pictured below: the machinery, the kitchen (was there really a single stove to prepare all the meals? ), the cafeteria, an old newspaper dating from April 3, 1990 (probably around the time the factory was abandoned; back then, Azeri was still written in Cyrillic). Now, here’s an interesting encounter. As we were walking the streets, we were approached by a guy in his twenties who told us he studied French and offered to take us out for lunch and visit the town with us. He even drove us back to Nakhchivan City in his Lada, with a lengthy stop at the castle of Alinja. As he had to go home to see his wife and sick child, he arranged for us to meet one of his French-speaking friends to spend the rest of the evening with us until our return flight to Baku. Much food and many beverages were had, and my recollections of the end of the day are a blurry mix of kebabs eaten at an outdoors restaurant in the middle of a rainstorm and attempts to smuggle bottles of vodka in carry-on luggage past airport security. Some of the details of this story still puzzle me. What was this “student” doing on an empty street in a sleepy town, on a week day, alone, without his family, nearly two hours from his house? Why didn’t he want us to take pictures of him? Was he… a spy?? ?